In this article I'll try to explain simple option trading. Remember Option trading involves very high risk and its not suitable for every trader. But there is nothing wrong in learning new strategies. To trade option you need to request your broker to enable option trading in your account. This can be done by filling out forms on the broker site. So call your brokerage account. What is Option Trading in layman term? When you buy a stock option, you are essentially buying the right to "buy or sell" a stock at a certain price, when you want to, IF you want to. There are no obligation to exercise the stock option at all. Different Types of Option ? There are two type of option: CALL option and PUT option. Call is similar to buying stock and you expect stock to go up inorder to make profit. PUT is similar to shorting a stock and you expect stock to go down inorder to make profit. Difference between buying stock and buying option ? Suppose you want to buy AAPL share which closed at $566.71 for 1 share. So if you want to buy 100 share it will cost 100 X 566.71 = $56,671. In option 1 contract is equivalent to 100 share. Call Option: Now if you think AAPL share will rise from from $566 to $570 then you will buy CALL. 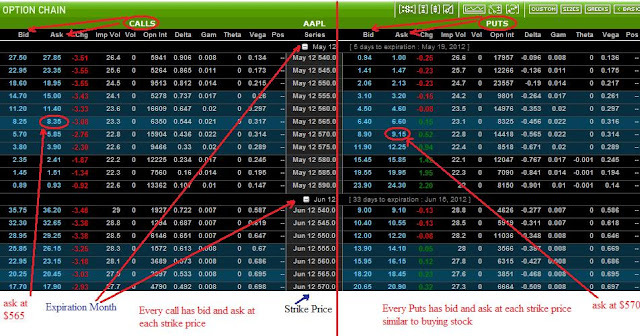 So to buy AAPL CALL option, at strike price $565, the ask price is $8.35. To buy 1 contract which is equivalent to 100 share of aaple it will cost 8.35 X 100 = $835. So instead of investing $56,671 your investing $835. Once your in profit simply sell your position like you close stock position and take your profit out. Exercising option means you purchase share which is expensive and most of the people don't do it. Remember every option has expiration date, so if you don't execute your option by expiration date it will become worthless. Put Option: Now if you think AAPL share will fall from from $566 to $560 then you will buy PUT. So to buy AAPL PUT option, at strike price $570, the ask price is $9.15. To buy 1 contract which is equivalent to 100 share of aaple it will cost 9.15 X 100 = $915. So instead of investing $56,671 your investing $915. Once your in profit simply sell your position like you close stock position and take your profit out. Option value of Calls and Put decreases as it nears to expiration date. Try to sell ahead of 3rd week of Friday, because on Friday it could be worthless. Try to buy option at the morning or at the close. I find closing time best for option trading. If the stock prices remain flat throughout the day, the value of your option will decrease. For e.g. If you bought AAPL 665 call and AAPL share is trading at 665 and at the close if AAPL share is at 665, you will loose money. Out of money calls is good for earnings or when you expect very sharp rise in stock value as they are very cheap. For e.g. Ticker symbol AVP is trading at $ 20.19. So if your expecting AVP will be bought out by another company for $25, then you can buy out of money call $24 which is cheap and it would cost $0.40, so to buy 5 contract which would cost 5 X 100 X 0.40 = $200. Most of the out of money call becomes worthless sooner then at the money. Out of money call/put is very risky and if possible avoid it as chances of losing money is much higher then making money. For AVP $20 would be consider at the money call, similarly if you plan to short AVP, then $21 put will be consider At the money put. Try to buy at the money call/put and look for smallest difference between Ask and bid. ASK is the price which you pay to buy stock and BID is the price you get when you sell stock. Never invest more then 2k in option in a low volume market. Don't be Greedy, as in option you'll get only one chance of profit and 5 chances of losing money. Look for delta value before buying call/put option. For example, with respect to call options, a delta of 0.7 means that for every $1 the underlying stock increases, the call option will increase by $0.70. Put option deltas, on the other hand, will be negative, because as the underlying security increases, the value of the option will decrease. So a put option with a delta of -0.7 will decrease by $0.70 for every $1 the underlying increases in price. As an in-the-money call option nears expiration, it will approach a delta of 1.00, and as an in-the-money put option nears expiration, it will approach a delta of -1.00.